Advertise the RoboTalker supplied phone number for people to call and hear your recorded message. Automatically build your contact list by inviting customers to send a text message to your private number. Automatically reply to each call with a text message containing links to maps, your website, or a sign-up page. Play a two minute recording to inform, pre-qualify, or notify a caller of promotions. You may prompt callers to press number one to speak to a live customer service agent anytime during your greeting. Each text message reply or playback of a message costs two call units. Call transfers cost two units for every 15 minutes. Send a text message, play a recorded message, or simply transfer each inbound call to your office. Inform customers that they will be receiving future promotions in text messages. Callers may leave you a voicemail, and you are notified via an email report which includes the recording and text transcription. You can have multiple phone numbers and accounts play multiple greetings and collect callers into multiple groups. 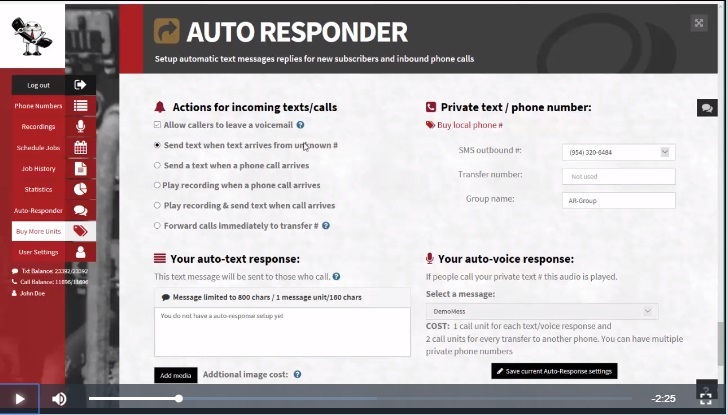 Robo-Responder really works for you 24/7! We are dedicated to helping your business grow by maintaining your connection with your clients! We work with several MLM clients, real-estate agents, and small businesses who do not have time to answer the phone and need a solution to filter their incoming calls and automatically send text messages containing directions, maps, and other web-based information.